HissTank › Compatible Military Toys › B2.Five Acid Rain Agurts Military R711 Laurel LA3R Review Gallery by C.I.A.D. B2.Five Acid Rain Agurts Military R711 Laurel LA3R Review Gallery by C.I.A.D. Discuss on the HissTank Forums› Views: 1008 › Credit: C.I.A.D. 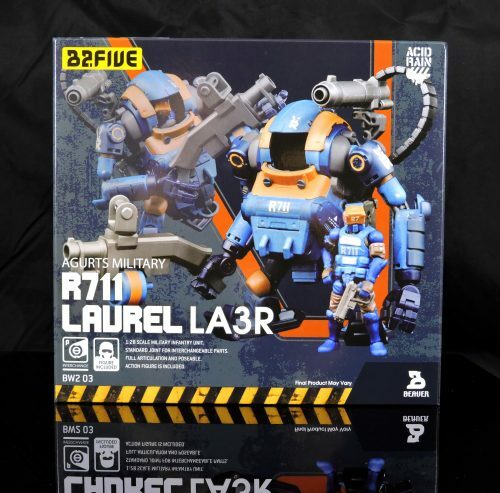 My first gallery will focus on the R711 Laurel LA3R set.The R711 Laurel LA3R is one of the latest additions to Agurts Military, namely the R711 Riot Team. This beautiful mechanized suit mirrors its 1:18th scale counterpart in both look and play features. The difference from its predecessor is its ability to interconnect pieces from other B2.Five Acid Rain offerings (sold separately) thanks to its modular design. It’s paint applications are stellar and with it being part of the R711 Riot Team, it has a very “Cobra Alley Viper” feel to it. The Pilot is wearing the signature R711 logo, which pops in white against a royal blue backdrop. well done, captain. I'm so close to dumping a lot of toys to get in on this line before it gets ridiculous on the secondary market. and thanks as always for bringing the goods. Thanks brother, happy to share the word!